. :: The Greatest Resorts & Cruises of the World ::. This is an unique, 1,300-acre development set in secluded Carefree, Arizona, 33 miles northeast of Phoenix,surrounded by towering cacti, vivid wild flowers, sage brushand a vast expanse of untouched desert where jackrabbits and cotton tails abound and the dramatic evening sunsets are embellished with the calls and sounds of wild birds and crickets. The main lodge which houses the reception area, two excellent restaurants, a shop and lounge is decorated in Southwestern design with original art, pottery and Indiancrafts. Adjacent to the lodge, located on a ridge is the main swimming pool and snack restaurant overlooking animpressive boulder formation and waterfall. Other sport facilities include two 18-hole, Jay Moorish-designed championship golf courses and the Boulders Club which is composed of a restaurant, swimming pool/ lounge area, tennis shop, eight all-weather tennis courts and the 33,000-square-foot Golden Door Spa. 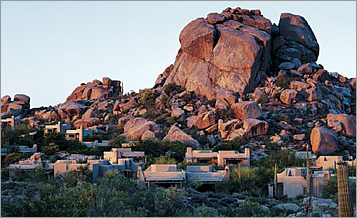 The 160 very spacious, one-bedroom adobe casitas and 50 two-and three-bedroom villas sprawl around the resort and golf course and are partially hidden by rock formations. All accommodations feature wood-burning fireplaces and large bathroom/closet/dressing room areas. Strong Points: Outstanding accommodations, charming rustic beauty, a natural quiet desert environment with top golf and spa facilities.